Stainless steel cafe front fender to fit the Suzuki Tempter ST400. 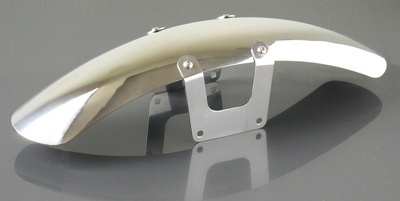 Stainless steel (304) cafe front fender to fit the Suzuki Tempter ST400. May be suitable for other makes with 75mm on center mounting holes. 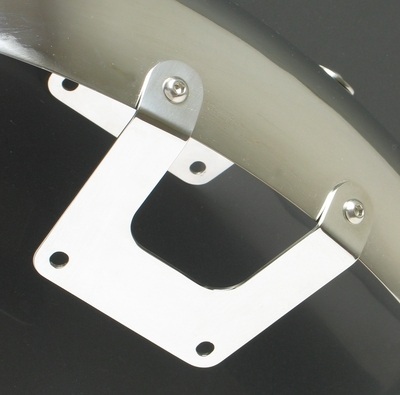 This premium quality highly polished cafe front fender gives a classic retro cafe racer look. Overall length 500mm. Width 112mm. Extra thick (3mm) stainless steel stays provide secure mounting to the fork sliders. The fender is heavier gauge stainless as well. On this model the stays are attached to the fender with stainless steel button head allen screws rather than rivets. When you hold this item, the superior quality will be obvious.